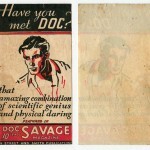 Possible New Doc Savage Premium? Anyone know what this is? I found it being used as a bookmark in one of my old Doc Savage pulps. It’s roughly business card-sized, 3.375″x1.75,” printed on thin, semi-glossy paper. It almost looks like a stamp. I thought it was cut from something else, but the trim lines are too perfect. Any ideas? 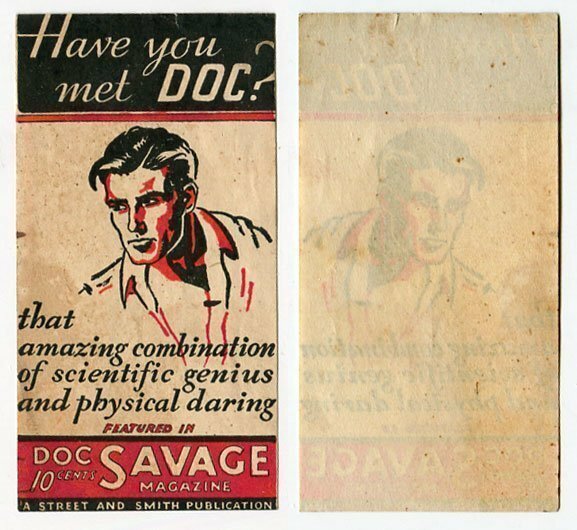 There were 2 versions of this Doc Savage Ad/Postal Card. One version was a black and white copy identical to yours shown above and on the other side it had a 1 cent postage stamp with the words” This side of card is for address”. It was meant to be mailed out as an ad. I will e-mail you a copy of the front and back of one. Then there was copy you show that was in color and it did not have the same backing, as you show in yrou cipy above. It was just given out as an ad item and not mailed out.